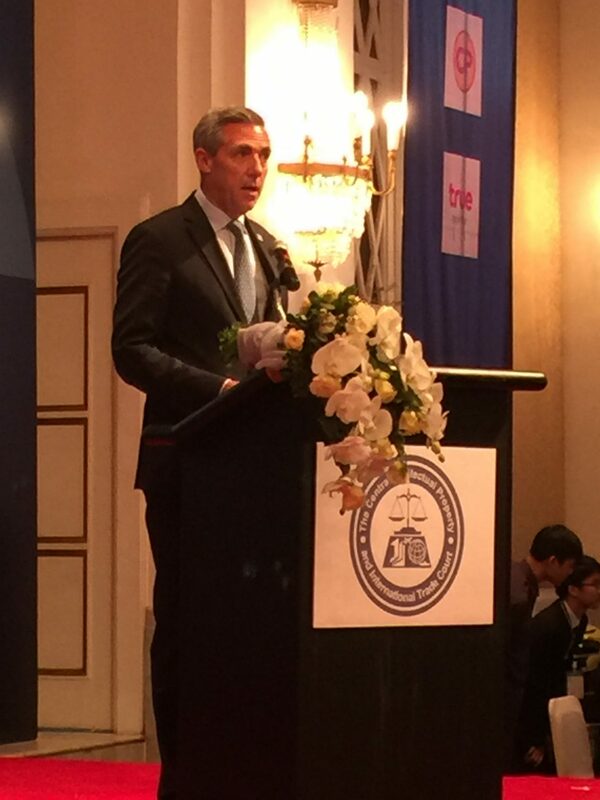 BANGKOK – So-called disruptive innovation – currently referring to the technologies of Internet of Things, virtual reality, artificial intelligence and big data – are changing the way people live their life and affecting existing traditional industries, but current legal regimes are unequipped to deal with these changes yet, government and private experts said at a recent forum here. The symposium, “Intellectual Property and International Trade and the Drive towards the Fourth World Industrial Revolution,” organised by Thailand’s Central Intellectual Property and International Trade Court to mark its 20th anniversary, took place on 19-20 January. Denis Croze, director of the World Intellectual Property Organization office in Singapore, who gave a keynote address on behalf of WIPO director general at the symposium, helped explain what the fourth industrial revolution is. Laying down the three previous revolutions, Croze said the first industrial revolution came with the invention of steam engines, the second with electricity and mass production, and the third with electronics, computers and automation. Citing the 16th edition of the Global Innovation Index 2016 co-published by WIPO, he said the fourth industrial revolution came with the availability of global and digital communications, low-cost processing and high-density data storage, along with an increasingly connected population of active users of digital technologies. These technologies include Internet of Things, robotics, artificial intelligence, 3-D printing, virtual reality and big data. Speakers said the changes brought about by these technologies have been fast, wide-ranging and massive in terms of volume. Koichi Matsushita, a director of the Japan Patent Office, mentioned a case whereby a self-driving car, or a car which can drive without a driver, causes a road accident with damages incurred. The question is who shall be liable for the damages: the car owner or the person or company which owns the software that runs the car. Jairak Euarchukiate, senior consultant at Thailand’s National Science and Technology Development Agency, said it is complicated because each of these disruptive technologies is involved with various aspects of intellectual property rights. Robotics, for instance, deals with patents, trade secrets, trademark and copyright (due to computer programmes in the robots). In highlighting another complication of IP law enforcement, Jairak asked since artificial intelligence (AI) is able to think and, hence, be able to become an inventor, then could AI itself file for IP protection? She said there are three ways of thinking now for such an issue: allowing AI to file for IP protection, the right to the invention created by AI shall belong to the AI owner, and AI shall not be allowed to file for IP protection. She further remarked that if AI could create, could AI become an infringer of IP rights as well? She suggested that technology laws be written in broad terms to allow it to be applicable to the changing environments. Despite the symposium title of fourth industrial revolution, many Thai speakers observed that most Thai industries remain in the second and third revolutions, and argued that the Thai government did not provide adequate support to invention. Chen Namchaisiri, chairman of Federation of Thai Industries, said 70 percent of Thai industries are in the second revolution and another 30 percent in the third revolution of automation. He said very few Thai companies have moved into the fourth revolution and those which have done did so because of their foreign parent companies. Chalermpon Punnotok, chief executive officer of CT Asia Robotics, which manufactures robots for export to Japan to help taking care of elderly people there, said Thailand lacks promotion and support for innovators and many talented Thai graduates end up working in non-challenging routine jobs in the bureaucracy or private sector. Thosapone Dansuputra, director general of Thailand’s Department of Intellectual Property, mentioned the few filings for invention protection by Thai people. He said among all the filings for patents in Thailand in the past 20 years, only 10 percent belonged to Thai inventors. But he also conceded that his department has been slow with filing examination and registration, leaving a big backlog of pending applications. Thosapone said his department plans to launch soon an innovation-driven enterprises centre to help and encourage Thai people to become inventors and innovators. 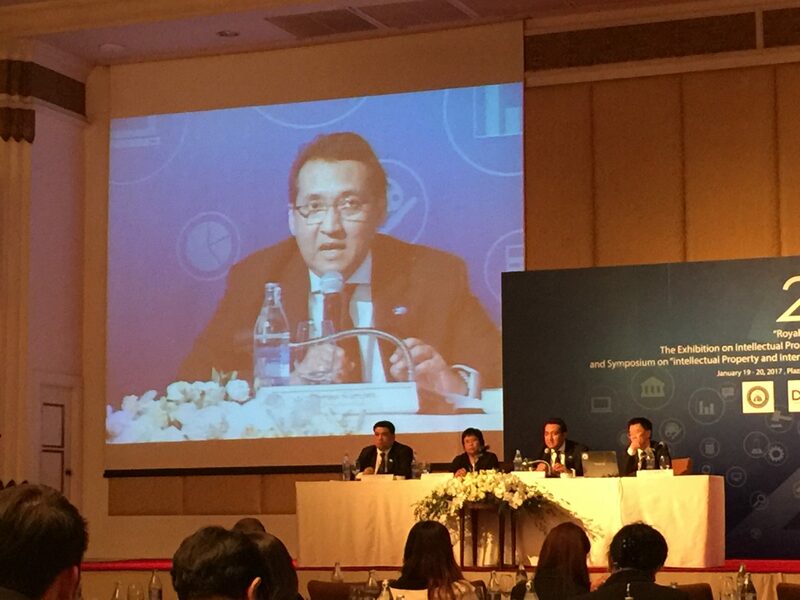 “Our IP system will become of no use if Thai people do not become IP owners,” he said. Despite the shortcomings mentioned by many speakers, the current Thai government has aimed to apply innovation in driving the country’s economy, a policy being coined as “Thailand 4.0”, with the creation of a new ministry known as Ministry of Digital Economy and Society in September 2016. Supreme Court Chief Justice Veerapol in his opening remarks talked about how the country should deal with the expected changes and what the role of the judiciary system should be. Veerapol said in terms of the Central Intellectual Property and International Trade Court, it can play a crucial role by providing “reliable and trustworthy dispute resolution mechanisms” to deal with issues arising out of the use of technologies and innovation. He said the court has already adapted to new environments by allowing use of video conferencing, digital audio and video records of witness’ testimonies, and electronic filings in its court proceedings. "Disruptive Technologies Pose Challenge To IP Protection, Speakers In Thailand Say" by Intellectual Property Watch is licensed under a Creative Commons Attribution-NonCommercial-ShareAlike 4.0 International License.